Ooooh, that’s an excellent idea! I know there are a number of other readathons throughout the year, and there’s nothing saying you couldn’t build your own if you wanted to make it a social event. I’d be in! Great job! I’ve never been able to read that much in 24h! Envious… Bet your Mamau is jumping for joy! It’s not the highest number of pages I’ve ever read during one, but probably would be if I’d been counting pages instead of time listened for The Maze Runner. There are some people who read literally THOUSANDS of pages during this event – I’ve no idea how they do it! Way to go! Moxie, Wendy & I are proud of you. You did great! 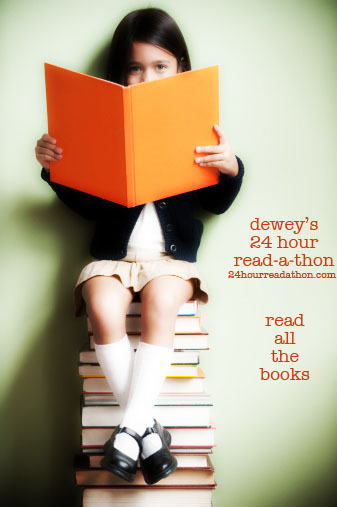 That looks like a great selection of books for a Read-a-thon — I’ll keep some of those titles in mind for October. Yay for raising $125! Great job for such a worthy cause! I would love to be involved with this next time it comes around, even though I read at a snail’s pace!